Competition, often associated with arguing and fighting, is usually considered a negative aspect within a relationship. But did you know that in a relationship where there is too little competition, there might be less passion? Utilizing some friendly competition can help you achieve a happy medium which will keep your relationship interesting and fun. Doing activities together that provide a means to enjoy some friendly competition can go a long way in keeping your relationship interesting and exciting. In a 2009 study by Kelton Research, 80% of respondents indicated that they would enjoy playing video games with their partner. While it might not be the most romantic of activities, it provides both individuals the opportunity to compete against each other in a healthy way. MSNBC conducted a similar study which identified that 55% of respondents actually do play video games together as a couple activity. This type of activity provides a fun thing to do together, and can also be used to release tension and stress. There are tons of fun activities that can be used. For example: ping-pong, pool/billards, darts, chess, tennis, foosball, various board games, etc. While many games were originally designed to be played by more than two players at a time, they can be easily converted to meet your needs. Playing against each other can be thrilling, but sometimes it can bring out undesirable outcomes. Put extra effort into being a good team player by being supportive, and offering genuine acknowledgements on their achievements (whether they win or lose in the end). Do your best to find activities that both of you are nearly equal matches in, so that the win/lose ratios for either individual is never too extreme. Remember also, that your significant other is your teammate for life. 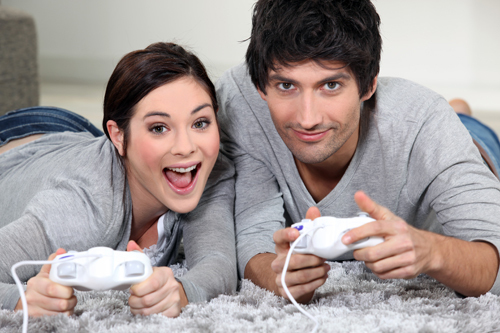 With that in mind, many couples enjoy teaming up with their partner against other opponents. If you or your partner feel this way, be understanding. You can always arrange to challenge each other at a different time. Remember: While some competition can keep your relationship exciting, success only comes to those that have positive experiences. Both individuals in the relationship need to demonstrate respectful, supportive behaviors, and keep the game fun for everyone.